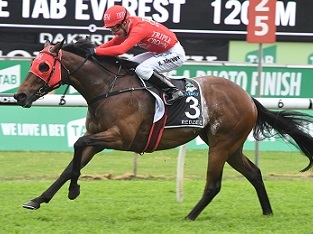 Redzel’s chances of defending his TAB Everest title will become clearer in a few days but the early signs are positive after the super sprinter was a shock scratching from The Shorts at Randwick when he was found to have injured himself in his box overnight. Co-trainer Paul Snowden said he knew something was amiss as soon as he arrived at 2.30am. “When I turned the lights on I saw his head out the door. He’s usually asleep and I patted him on the forehead and said ‘what are you doing up, what’s wrong with you?,’’ Snowden said. “Half an hour later he’s getting saddled up and worked as normal and he was scratchy coming out of the box and that was about 3.30am. I had a fair idea what it was. Redzel was worked on by the stable’s chiropractor and by the time Snowden left for Randwick the gelding had been treated with pain killers and seemed more himself. But it’s once the pain relief wears off, Monday or Tuesday, that Redzel’s next steps will be known. All being well it’s likely Redzel will head to The TAB Everest via either a barrier trial or the Premiere Stakes (1200m) on September 29. “There didn’t look to be anything drastic like a tear,’’ Snowden said. Trapeze Artist took over as favourite at $5 for The TAB Everest with Redzel easing to $6. Rod Northam will be keeping his mobile phone very close to him on the back of the run of After All That in The Shorts (1100m). The seven-year-old is of course eligible for The Kosciuszko. “He went super, and he has a lot of improvement off that too,” said Northam. “I thought he was going better than last year and going through his form it looked like he was, and he ran so well in this race last year I thought we’ll give him a shot. Northam, who owns the horse himself, revealed he had fielded a couple of calls already. “We’re not after any extraordinary deals. We’d just be thrilled to just have a runner,” he said. Meanwhile, The Monstar finished fifth in the race and trainer Brett Cavanough has also had contact from a number of slot holders prior to The Shorts. “I’m sure he didn’t harm his chances today,” Cavanough said. Pierata went down to Siege Of Quebec in the Bill Ritchie Handicap but his reputation was only enhanced. 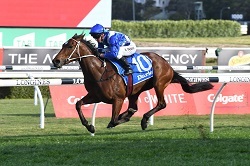 The four-year-old, who was a month between runs after missing the Tramway Stakes, was wide the trip at Royal Randwick and looked set to hold on but was nosed out on the line. "There was a four kilogram difference between first and second," Greg Hickman said. "His run was great. He looks enormous and had improved plenty this week. Once you get him fit you just have to keep him at a level, just tick him over. He just keeps eating, and eating and eating." "You can blame lots of things (for today's defeat) but the main thing is if he drew barrier 4 he probably turns it around." The traders at TAB were impressed enough with the run, cutting his Epsom price down from $11 into $8. Pierata will carry 54kg in the $1m feature. 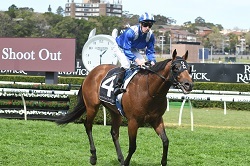 On the $1m TAB Epsom Handicap (1600m), could Muraaqeb, winner of the Shoot Out Mile, be a sneaky chance later this month? Co-trainer Ben Hayes is setting his sights on the Group 1 feature after the four-year kept kept his unbeaten record over the Randwick mile intact. Jockey James McDonald earned high praise from Hayes for putting Muraaqeb in a winning position outside the lead and from there he controlled the race and forged away late to win. “We gave him full rein, it was all his decision to roll forward and he made the right decision,’’ Hayes said. If Muraaqeb, $101 into $51 with TAB after the win, does squeeze into the Epsom he’ll carry 50kg and Hayes will be on the lookout for a new jockey as that weight out of McDonald’s range. The punters might have dropped off Miss Fabulass, sending her around $10 in the Tea Rose Stakes, but Kris Lees never lost faith in the Frankel filly. "She has the brilliance of her mum. She just hasn’t got the race sense but it’s coming," said Lees, with Punters Intel revealing a 33.69s last 600m. “She was ridden quieter at her first race start due to a wide gate and we discussed it with Kerrin (McEvoy) after the recent run when she put herself on the pace and we felt she would be better quieter. "He had plenty of horse underneath her and they weren’t going that quick but just looked for a bit of room and she really let fly. We know she can do that once or twice a week at home." Next stop is the Flight Stakes where she is now a $3.50 favourite with TAB, with Lees keen to keep her and stablemate Smart Melody apart for now. “It's likely Smart Melody stays in Melbourne, Miss Fabulass stays in Sydney. Smart Melody was very good today. We'll take her to the 1400m and see if she can run that trip and if so will go to the Thousand Guineas," said Lees.